When I was Googling for parties with My Little Pony themes, almost all of the girls who had it were five-year-olds or older. It's undeniably a little lady's favorite. My little girl breathes ponies day in and day out. Instead of saying everybody, she'd say "every pony". She'd sleep with her ponies, plays with them whenever she can and sometimes tags them along when she poops. Haha! Yes, she is that hooked to the colorful gallopin' cuties. So even without asking her, I decided to make it as her school party's theme. As you will see in the photos, the ponies weren't that evident 'cause it's not easy to look for MLP merchandise here in the Philippines, so I played with colors of the ponies instead. Warning: I'll be flooding this post with photos from the event. I enjoyed being the photographer that I didn't have a photo with the celebrant. You know, something for posterity. Well, we had one; a family selfie inside the car. That'll do. Hehe. Anyway, if I had the means and money, I could have just ordered party paraphernalia here. But because we're a single-income family, I went DIY. Momma, I had a blast up to the littlest of details! I asked Sophia's godmother, my cousin V, to copy (yes, almost plagiarize haha) the MLP invite I saw over the net. It was not the exact same thing but she's just that good to make it look like it. Yes, I'm Photoshop-challenged! Most of my photos were edited via Photoscape and some headers were made in PowerPoint! Don't judge, I'm trying to learn it. Anyway, I used colored papers to spruce it up a bit more and polka paper tape for the names of Sophia's classmates. I bought Tiramisu Meltdown from Red Ribbon and jazzed it up with rainbow-colored candy-coated chocolates. Definitely one of the kids' favorites to look at, but never dared to touch. Haha! The cupcakes were gifted by one of the moms I featured here. Christine Guerrero was a graduate of HRIM in CSB and yes, she can bake! She now sells custom-made cupcakes at a very affordable price (more affordable than most cupcake sellers I know). Right now, she accepts orders through her personal Facebook account. I placed the cupcakes in my dessert servers that I got from Happy Cakerista. It can hold around 18 properly lined-up cupcakes. It's easy to clean afterwards. I think it's something that a party DIY-er mom must have. I just fried cocktail hotdogs, added in colorful marshmallows and secured it with a toothpick adorned with flaglets made of paper tapes. I placed it in cute candy cups from Kidzco. There were unbranded nacho chips I bought in Marikina Dry Market for Php52 a pack, caramel popcorn, lollipops, twisted marshmallows, wafer sticks in green, purple and pink, Regent Mochi, sweet fruity candies in foil packs and the classic meringue. Khay of Charms' Sweets sent us a hefty box of yummy pastillas and macapuno, too. I placed the wafer sticks in pink halo-halo glasses that I bought in Marikina Wet Market for Php10 each. I saw how the the kids had fun choosing what to eat first! My namesake caught my attention as she was the only kid with a full plate! Yup, another Denise, who knows how to get what she wants. Ha! I regretted not having much time to prepare for this. I was totally focused on filling up the "junk table". I wished I put in more candies and fun stuff inside the tumbler. Anyway, the tumbler was around Php30 only. I placed a face towel inside which was tied in a pink yarn, and I think the moms (and yayas) were happy to see it. An energetic preschooler cannot have too many towels, you know. The tag was also created by my cousin, V.
THE GALLOPIN' GALA OF SWEETS & FUN! At first, the kids were not sure on what they would get first. I guess, they still can't believe that they can eat what their parents told them not to. Hahaha! Hence, the presence of water, aside from the orange juice I served. I'm not so sure if the ponies - er - kids enjoyed it, but I know my birthday girl did. Going DIY is such a task but I loved each and every minute of the preparation. HAPPY BIRTHDAY MY LITTLE BEBENG! Galing muther! Love the details! Parang meron akong gustong gayahin sa spread mo. The hotdogs with marshmallows in the candy cups! hihi. Tomorrow is Tala's school party naman. :) Belated Happy Birthday to Little Bebeng! nakakaamaze talaga ang DIY party mo muther.. kaso talagang wala ata akong artistic talent. bongga ng party. Belated Happy Birthday again LB! Amazing! 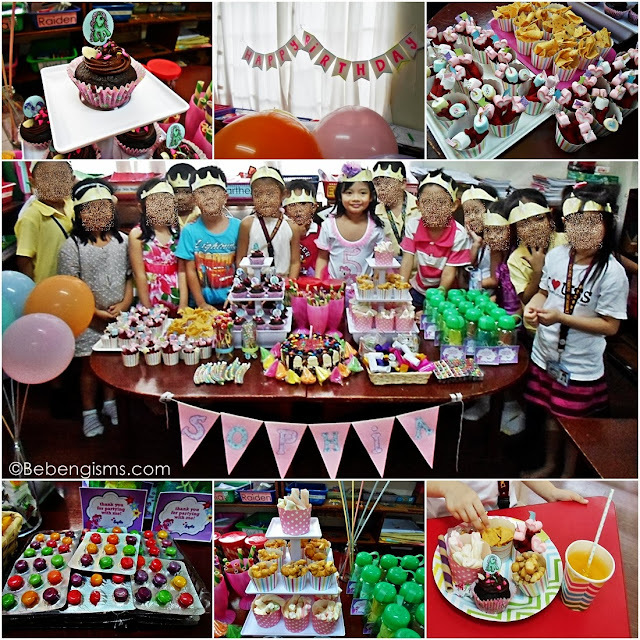 San mo po nabili ang cupcakes tier? Kaya lang, Mindanao pa ako eh. My daughter's birthday will be next month. I hope it will be as cute and successful as what LB had. God Bless! Grabe! Ang galing ng presentation. Wish I could be this detailed when Geoff goes to school. im thinking to diy baby's candy bar on her 1st bday kaso ang hassle. however after reading this post, nainspired akong ituloy na! =) good luck sakin! Hello, where did you get the stickers at the end of the hotdog with marshmallows? are those tapes? like instead of putting foil i can probably use that instead. Did you make the banners?